Concept version based on Jeep Grand Cherokee to be unveiled in Frankfurt, source says. MILAN – Fiat S.p.A.'s ultra-luxury Maserati brand plans to build its first sport-utility vehicle at Chrysler Group's Jefferson North assembly plant, said a person familiar with the matter. A concept version of the model, which will be based on the Jeep Grand Cherokee, is due to be unveiled at the IAA in Frankfurt next month, said the person, who declined to be identified before the official announcement. The American-made Maserati SUV is a product of the integration between Fiat and Chrysler. Sergio Marchionne, who runs both carmakers, aims to expand Maserati and sister brand Alfa Romeo by drawing on Fiat and Chrysler's combined size to boost profit. The strategy mimics Volkswagen AG's blend of volume brands and high-margin luxury nameplates that's helped Audi generate more than 40 percent of the group's earnings from less than 20 percent of sales. The project risks turning off fans of the brand's sleek Italian styling and sporty reputation like Geoff Lancaster. The 61-year-old owner of a 4200 Spyder is concerned that a Jeep-based Maserati could fall flat like the TC project between Chrysler and the Italian carmaker in the late 1980s. "The crucial thing is going to be how well they differentiate it from its Grand Cherokee roots," said Lancaster, who works in London and has driven Maserati cars for the past seven years. "Maserati will have to wave their magic wand over it quite aggressively to make it competitive." The Italian manufacturer aims to counter that concern and replicate the success of Porsche SE's 57,930-euro ($84,044) Cayenne. The German manufacturer now relies on the SUV for half its deliveries, even though it shares its chassis and many other parts with the 49,600-euro VW Touareg. A smaller Porsche SUV is under development for 2013. "The important point is that whatever Maserati we launch will be a product that respects the entire heritage, image, characteristics, and customer expectations of this brand," Harald Wester, Maserati's CEO, said in a March interview. "What ends up in the dealer shops should be 100 percent Maserati." The Italian manufacturer declined to comment on Maserati's product plans ahead of the Frankfurt show. Fiat is taking the risk in a bid to tap the higher profit margins for luxury SUVs. The models can command about 10,000 euros more than a sedan, while using much of the same technology, said Ian Fletcher, an IHS Automotive analyst in London. Demand for large upscale SUVs is set to expand 24 percent to 1.09 million vehicles in 2015, according to IHS. "It should be a real Maserati and not just another SUV," said Fletcher. "A Maserati SUV goes in the right direction. It just needs to sit within the rest of the range." Demand for luxury SUVs has nearly doubled since 2000 as high-end carmakers target the lucrative niche. BMW AG introduced the X1 in 2009, expanding its lineup to four SUVs. Audi introduced the Q3 this year, and Tata Motors Ltd. unveiled the Range Rover Evoque. VW's Bentley is also considering an SUV. The new Maserati would advance Fiat and Chrysler's integration. Joint projects include the development of more than 20 vehicles based on the same compact platform, including an Alfa Romeo SUV, the Jeep Compass, a Fiat sedan in China and a fuel-efficient Dodge. Fiat assembles the retro-styled 500 subcompact for the U.S. at Chrysler's plant near Mexico City. The goal is for the carmakers to reduce costs and generate more than 100 billion euros in revenue by 2014. 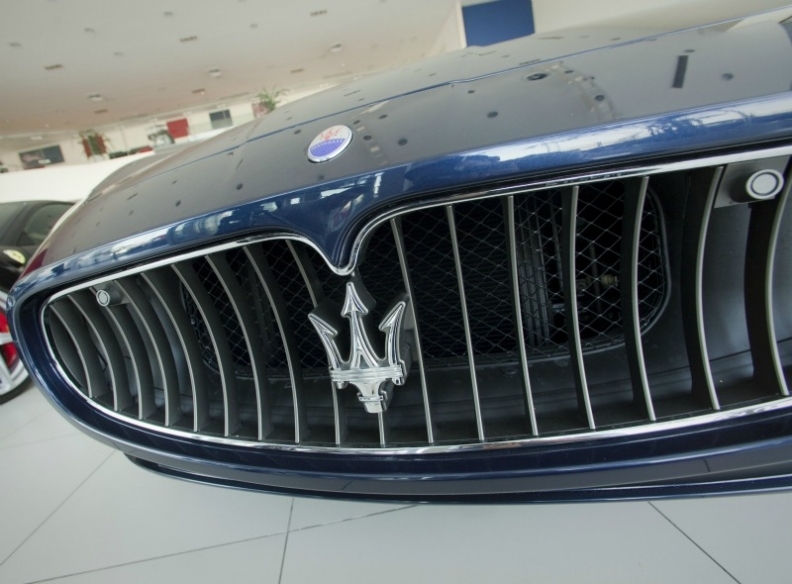 To boost Maserati, Fiat is investing 500 million euros at its Grugliasco factory to produce a new line of sedans. The investment could expand the brand nearly ten-fold, with production rising to as many as 50,000 cars a year, compared with 5,675 cars last year. Fiat, which bought the 97-year-old brand in 1993, struggled to stem the unit's losses until 2007. Maserati's profit rose 12.5 percent in the second quarter to 9 million euros on sales of 168 million euros. "Maserati is making good progress, notwithstanding the fact that we're still living off a set of architectures which I think are in need of an upgrading," Marchionne said in a July 26 conference call. "By the end of 2012, we will be able to see new models that will be coming into the marketplace." Even by breaking with its Italian roots, the brand identified by its trident emblem has a chance to win over customers if the carmaker can turn the Jeep into an authentic Maserati. "It's a trick that can be pulled off," said Maserati- owner Lancaster. "The current management is very canny."